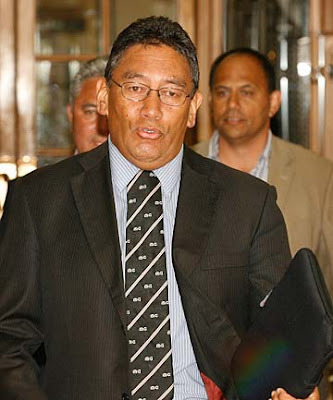 BREAKING NEWS: Hone Harawira has quit the Maori Party and cut a deal to protect his hold on the Tai Tokerau seat at this year's election. In a joint statement released after the Maori Party council finished its hearing today, Harawira and Maori Party president Pem Bird said neither wanted to see the party "destroyed by in-fighting". "We have come to the point where it is agreed it would be best for myself [Harawira] and the Maori Party to part ways and focus on issues," the statement said. Harawira would continue to serve as the Tai Tokerau MP and would stand at this year's election as an independent MP or as a member of another party. The frantic behind the scenes deal that has been ongoing for some time has finally been cut, the Maori Party will not stand against Hone, Hone won't stand anyone against them in any of their Maori electorates, the options are now open for Hone to decide if he can best stop this anti-beneficary, anti-environment, anti-worker Government hell bent on crippling the Welfare State and privatizing our assets as an Independent or as a New Left Party. "Maybe that's what you should ask the Mana electors, Matt. To stop looking over their shoulder at Labour. Could be your slogan: 'Vote - as if you were free'." ...that's exactly what is being attempted by exploring the possibility of a New Left Party that would alter the MMP math in Parliament to stop a Government wanting to punish society's most vulnerable, vote as if we were free. The reality is that the Greens, Labour and the political left need better allies than Winston Peters. This truce allows the Maori Party and Hone to work together past the election if the numbers stack up to change the Government. In an election that could go down to the wire, 3 extra MP's to the left could be the difference between forming a Government and not forming one. ACT is facing rumbles of a new Right Wing Party in Epsom, while they could never beat Rodney, they could certainly deplete his majority enough for the National candidate to win. Even if Rodney does win Epsom, he won't be bringing an extra 4 MPs with him, the 3.6% they scored in 2008 was with the backing of the Sensible Sentencing Trust and that political brand is poison after the hypocrisy of Garrett. Dunne could lose to Chauvel, especially with so many public service job cut backs, and NZ First with their 3 big policies aimed at National Party rump vote are hoping they can become the National Party protest vote and get over the 5% threshold to hold the balance of power. Key ruling Winston out however is unlikely to convince die hard National supporters to protest, especially with Key's beautifully timed bennie bash to keep those rump National Party voters content with raw meat welfare policy to chew over. The big question is can John Key get National 47%, the number that would allow them to govern alone. It's a higher percentage than his 2008 high tide mark, which would be hard but not impossible. Key could get 47% if the economy gets better, but if petrol prices start causing major inflationary pressures alongside the cost of food, minimum wage earners and those on the benefit (who are already on the welfare chopping block) are going to get angry. That political anger could find representation with a New Left Party. The shock of Christchurch means these political machinations will go unnoticed, but this deal between the Maori Party and Hone not to run against each other could be the biggest unseen political ripple of the year. Dunne should have lost to Chavel last time but for Green voters not voting strategically to get rid of him. This should be a key part of this years Lab/Green Ohairu/Belmont strategy. THe party fucked itself the minute they hitched their wagon to Jonkey; and reinforced their demise as T T couldn;t untangle her knickers over her Helen Kluk bitterness. It was also compunded by the fact that many wondered what the hell she must have over Pita to cause such blind faith and loyalty on his part to her bitter attitude and behaviour that one might normally put down to a hormonal imbalance or something similar. MP is fooked - tho' it was a long time ago, and that's a real shame. Still, had they been up front and honest with thier constituency, and not become enamoured with cargo-cult-like treats and trinkets, things might be diff. They once had my total and utter support. I piss in the hole that will become their grave these days, and few of them - other than Hone) deserve any sort of acknowledgement. You just might get your wish, mate, things are lining up. The accommodation has been reached with the electorates and that is a very helpful nudge - Maori electorate voters can now vote for Hone's party AND keep their Maori Party MPs. As a way of registering discontent with the Party (without knocking them out) these voters can now have their cake and eat it too by splitting their votes. This could mean at the least half a per cent and on a good day 1.5% of the total vote for this new party coming from the Maori roll.